Embedded in Modernism is the ideal of mass production. The repeatable object, each equal in quality, form and use, is the essence of the twentieth century in contrast with handcrafted artifacts of previous centuries. The impact of the democratization of goods, services, and architecture – from cars to movies to billboards to McDonalds – was tremendous. 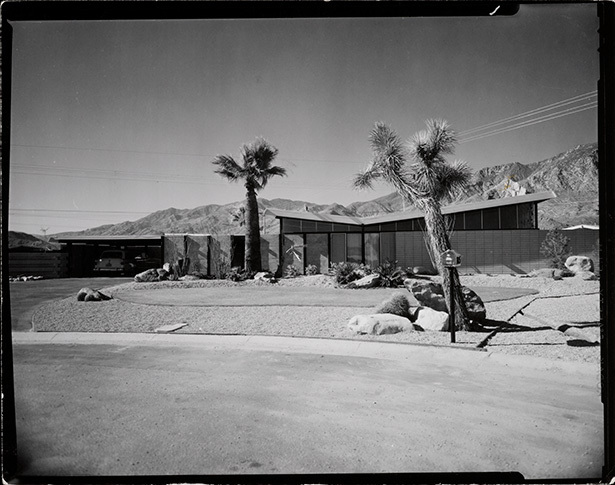 It is the point where the machine and mass production bring Modernism to the mass audience; it happened in Palm Springs when father and son George and Robert Alexander brought architects Dan Palmer and William Krisel from Los Angeles to the Coachella Valley to design the first extensive tract subdivision in Palm Springs. Strikingly Modern with exposed concrete block, butterfly roofs and open plans. Palmer and Krisel’s designs proved pure Modernism would sell in the marketplace. Merchant builders George and Robert Alexander were two of many housing developers working in the Los Angeles area in the boom years after the second World War. Robert Alexander was eager to establish himself with his own ideas and projects in the early 1950’s; when he met architect William Krisel socially, the two began to discuss how to build Modern housing tracts at a time when ranch and Colonial were still the favored, sellable styles. 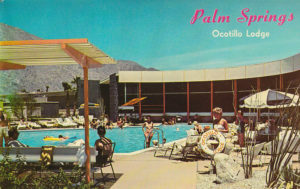 George and Robert Alexander’s first Palm Springs project was the Ocotillo Lodge built in 1956 and designed by Dan Palmer and William Krisel. It is still an iconic building on the corner of East Palm Canyon Drive and Camino Real. It combined two-story motel room wings along the highway, and one-story bungalows clustered around the pool behind. After the completion of the Ocotillo Lodge, George and Robert Alexander plunged into the housing market, beginning with thirty-nine houses in the Twin Palms area adjacent to the Ocotillo Lodge. At the time Palm Springs was primarily a town of individually built houses. George and Robert Alexander helped bring the era of mass housing-well established in Los Angeles- to the desert, but with adaptions for the climate and customers. They would change the face of the desert. To Krisel, modernism seemed more acceptable to clients in the desert, where the casual life and extreme climate encouraged nontraditional architecture. The first Alexander homes sold well, and they were followed by a development of larger homes in Vista Las Palmas nearer to town and in older established neighborhoods. 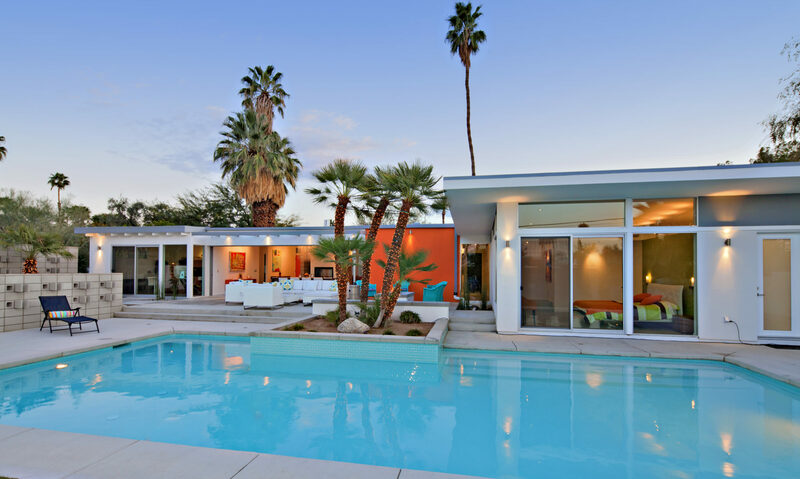 The developments were quick successes, and George and Robert Alexander continued to build in the Palm Springs area often with William and Krisel as their architects, though they also supported the adventurous steel houses designed by Wexler and Harrison. George and Robert Alexander kept building in Palm Springs – housing, offices, and a few very notable custom residences. One of the most well-known is the Alexander house in Las Palmas which is the Lawford/Kennedy house, originally built for Peter Lawford. Another well-known Alexander is the “Honeymoon Hideaway” on Ladera Circle, built by Robert Alexander for his wife in the early 1960s. .
George Alexander and his wife Mildred, also known as “Jimmie”, and their son Robert Alexander, with his wife Helene, were killed on November 14, 1965 on an ill-fated flight from Palm Springs to Burbank. The Alexander Construction Company ceased operations with the deaths of its principals.